One weekday while at work, Bunya Usui, a long-time and dedicated AXA Life Japan employee, was having trouble reaching his elderly mother. She’d left the house without alerting anyone, and wasn’t answering the phone. 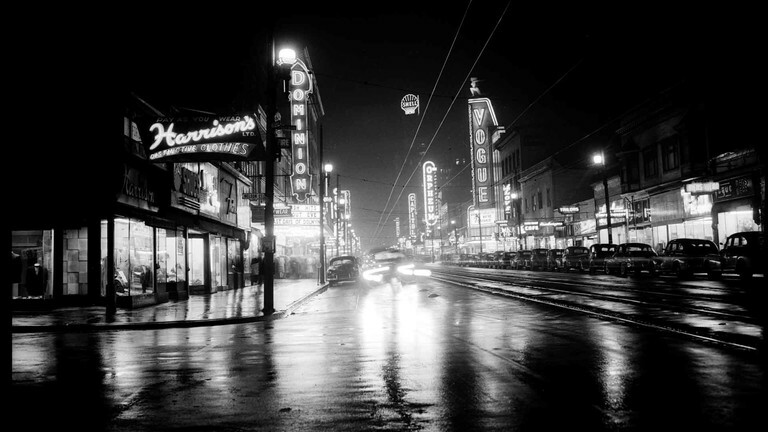 As she lived on her own in another city and had just recently started developing Alzheimer’s, he was understandably worried. After some frantic moments, and several panicked phone calls, she was found without incident (she’d gotten lost after doing a bit of impromptu shopping). The incident got Mr. Usui thinking there had to be a simple, effective and non-intrusive way of keeping tabs on his mother from a distance, 24/7, without having to constantly check in. And if there wasn’t, well, he’d create one. This is how the original idea for “Are You Ok?” was born. An innovative app for seniors and their families, developed by Usui, colleague Yoshinori Kasahara, and a cross-continental team of AXA managers, designers and developers. Launched several weeks ago, it’s already helping Japan’s senior citizens stay connected with their families and live better, more fruitful lives. In Japan, over 10 million households include at least one family member over the age of 65. Additionally, 5 million of the country’s senior citizens live on their own. This means 3 out of 4 Japanese adults “worry every day about their elderly parents’ health and safety”, according to Usui’s original video pitch for the app, “and would like a way to monitor their parents”. Armed with this information, and having just experienced the incident with his mother, he developed an idea for an app that would feature a geo-fence around an elderly person’s home (including commonly visited places such as a local bakery or supermarket) that would alert the rest of the family should they wander off. But he couldn’t build it alone. 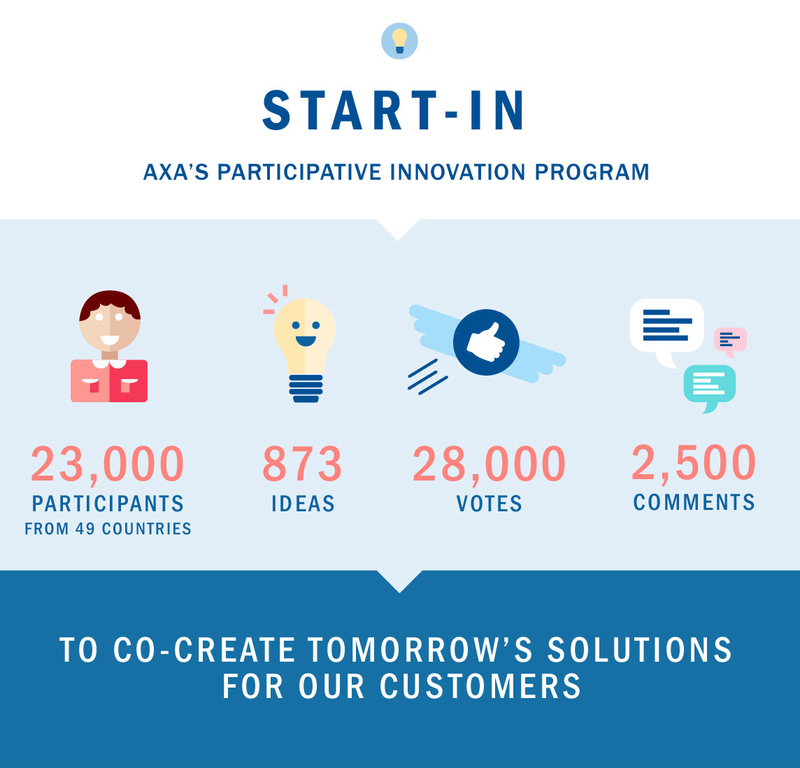 At around the same time, AXA had launched Start-In (see our introductory article here), a participative innovation program featuring ideas from employees around the world, with hundreds of submissions each year. 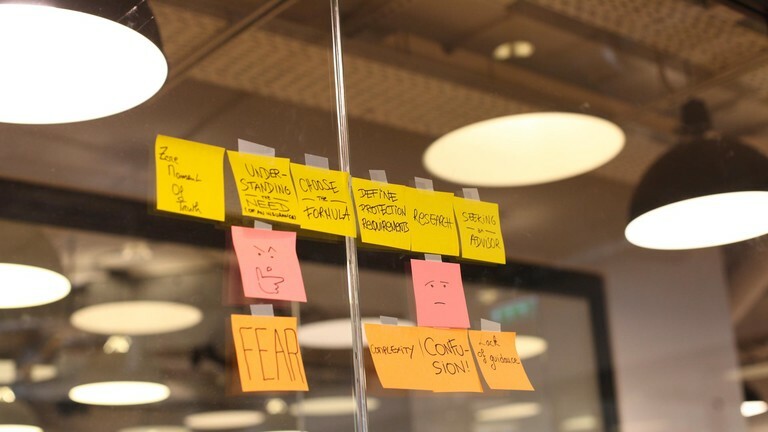 With Start-In, selected ideas are fast-tracked from concept to development to product launch, first in one AXA market, and then, if successful, around the world. Usui, Kasahara and their AXA Life team knew this app would be highly beneficial to the AXA ecosystem, as it would help retain active policy holders, generate revenue and reduce medical claim payment ratios for seniors. So they submitted the idea for the app called Are You Ok? to Start-In, and were immediately invited to participate. On the other side of the world, at AXA’s headquarters in Paris, one of the first people to get involved with the project was Guillaume Vernade, Digital Project Manager at AXA’s Digital Agency. Together with DA Manager Paul- Henri Chabrol, he immediately saw the app had a much larger potential, way beyond the initial idea of keeping track of seniors’ whereabouts. After all, people are becoming more and more mobile, with families scattered around the globe and seniors often living on their own, far from other family members. Wouldn’t it be great if this app could help bring them all together, even over large distances? c) Inactivity: and there are emergency situations that are accompanied by inactivity, rather than activity, and it’s important to distinguish between the two. So, from Tokyo to Paris, it was agreed the app would feature a communication stream in the form of shared family messaging; a sort of private social network, but with a focus on the elderly members. This would enhance not only the safety of the seniors and peace of mind of the other members, it would also lead to closer ties and better relationships: a win- win-win situation. The app would feature geo-fencing and other sensor technologies to determine if elderly users were in “trouble”, and contact family members in case they needed help. It would be provided free to AXA customers (after all, it’s in everybody’s interest, including AXA Life, that seniors live happier and longer lives), and would be integrated, where possible, with AXA Assistance phone services. All that was needed was some very hard work to turn Mr. Usui’s dream into reality. The project was already stretched across three continents, with a 7 to 8- hour difference between Tokyo and Paris. And now, with implementation getting closer, a new stakeholder was on board: Marcin Detyniecki, Senior R&D Officer at AXA’s Data Innovation Lab (DIL). Set up by AXA to use data, predictive models, analytics and other advanced technologies to better serve its customers, DIL builds scalable tech platforms and supports entities on projects. With Are You Ok? it’s main goal was to set up a mechanism to collect data usage to improve overall efficiency of the service. 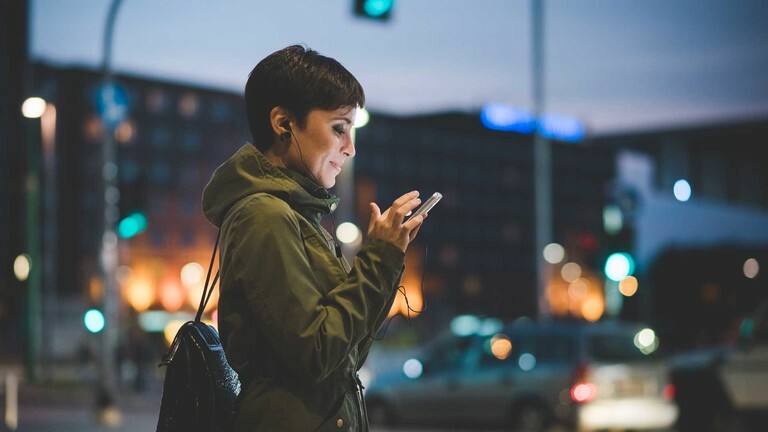 Back-end and architecture were the responsibility of AXA’s Digital Agency, and an AXA Group Solutions development team located in Barcelona came on board for the project. So: Paris, Barcelona, Suresnes (DIL’s offices just outside Paris) and Tokyo. Four locations, many languages, one great challenge. This meant work had to be approached in an innovative way, from the start. A lean start up framework was chosen to develop a Minimum Viable Product, that would make its way to market quickly. The team was gathered together physically for weeks on end, during both the design and test phases, to bridge these gaps. Agile software development methodologies were implemented to cope with the complexities of the project, including the many timezones and languages (the initial version of Are You Ok? required work in all three Japanese character sets: Hiragana, Katakana and kanji). And finally, focus groups were convened to test the value proposition. All this work was highly decentralized between Paris, Tokyo and Barcelona. 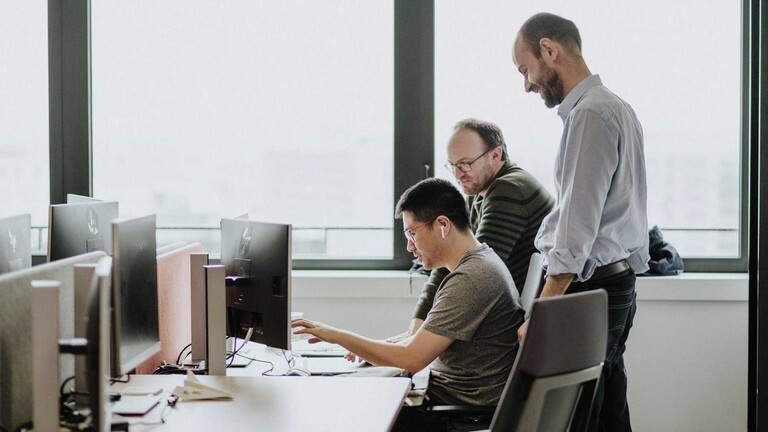 Which is how one of DIL’s engineers found themselves working alongside the development team in Barcelona, and Guillaume found himself flying to Tokyo to spend time with the Japanese team, that included Saori Uchiyama (the product owner), Miki Hasegawa, their manager Yoko Sakata, and Nicolas Homo, Head of Digital Transformation at AXA Life Japan. Yoko and Miki also spent intense days in Barcelona with the development team. Needless to say, many long nights peppered with take-out food ensued, as the project required asynchronous communication with Europe (questions Tokyo had in the morning could only be answered in the evening), people walking around the office for 3-4 hours at a time with four or five devices in hand, and frequently heated discussions that could only be resolved over beers and karaoke. Eventually the teams settled on a peer-to-peer way of working, with a dedicated group on LINE (a Japanese equivalent of WhatsApp, quite popular in Asia) and other sharing tools dedicated to the project. To make the proverbial long story short, they managed to implement a successful total solution in less than 8 months, across 10,000km and 10 time zones. If you’re feeling adventurous (this original version is in Japanese), you can find Are You Ok? here. But what of Mr. Usui, who, in the meantime, continued his daily work at AXA Life Japan? Well, when faced with the live app on his mobile for the first time, knowing many people like him could feel a bit better about their elderly parents’ safety in the future, a wave of emotion swept over him as he looked up to his teammates and smiled. Watch this space for a future follow-up on Are You Ok?.